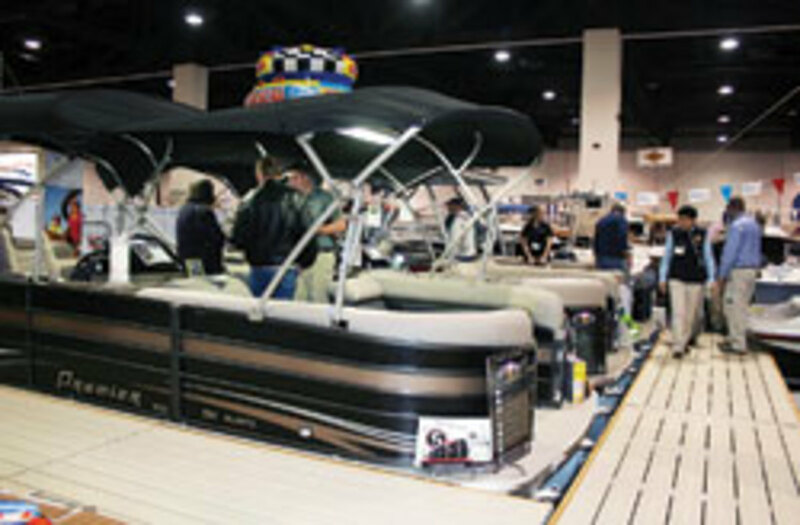 Boat sales began 2012 much the way it ended the previous year, with strong gains in two aluminum boat categories and the largest category of fiberglass boats. January sales in the high-volume 11- to 40-foot outboard fiberglass segment were up 14.4 percent, to 1,064 boats, from the same month in 2011, according to figures compiled by Aarn Rosen, national sales manager at Statistical Surveys Inc. Sales of aluminum fishing boats rose 17.3 percent in January, to 861 boats, and sales of aluminum pontoons rose 20.6 percent, to 263 boats. The double-digit increases helped to lift overall sales in the industry’s main powerboat segments by 10.5 percent for the month, to 2,599 boats, from January 2011. Those segments consist of aluminum fishing and pontoon boats, plus fiberglass boats in five segments that range from 11 to 99 feet. Industrywide, sales for the month were up 8.4 percent, to 3,756 boats. The January results were tempered by the fact that the month traditionally produces the second-lowest sales volume of the year. January sales are just 2.6 to 3.5 percent of annual retail activity, but Rosen said the significance of the gains industrywide and in the main powerboat segments shouldn’t be discounted as the spring selling season — February through May — gets going. The sales information for January is based on registration data from 31 early reporting states that represent about 65 percent of the U.S. market. Rosen said reports of sales of documented vessels were complete only through Dec. 13 because of data entry delays at the Coast Guard. For that reason, he says, sales figures for boats 30 feet and larger are significantly understated in the data. 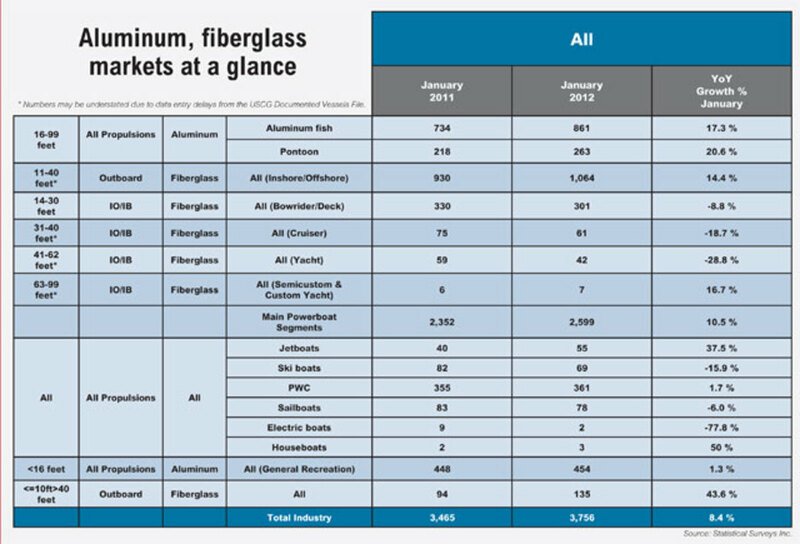 Although industry sales rose overall in January, some fiberglass segments struggled. Sales in the core 14- to 30-foot category fell 8.8 percent for the month, or 29 boats, to 301; sales in the 31- to 40-foot cruiser category dropped 18.7 percent, or 14 boats, to 61; and sales of 41- to 62-foot yachts declined 28.8 percent, or 17 boats, to 42. “The fiberglass sterndrive business remains softer than all of the aluminum segments, but it’s better than last month,” Rosen said. Sales of personal watercraft rose 1.7 percent in January, to 361 units. Sales of jet boats rose 37.5 percent, to 55 units, but sales of ski boats dropped 15.9 percent, to 69 units. Sales of sailboats fell 6 percent, to 78.